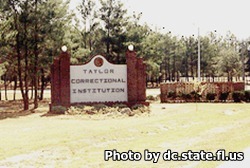 Taylor Correctional Institution is located in Perry Florida. The facilities are level V and house male adult offenders in a minimum, medium and closed custody setting. The main facility can house about 1,300 inmates, while the Annex can hold approximately 1,400. Offenders at both locations can participate in education programs that allow inmates to earn a GED or obtain an adult basic education. Substance abuse treatment for offenders is available at both facilities through Alcoholics and Narcotics Anonymous. The chaplaincy at both facilities has studies in a wide variety of religious beliefs. Anger and stress management, starting a small business, credit and debt management, and life mapping are just some of the re-entry and personal development courses offered to inmates. Visiting is for approved visitors only. To become approved you must first fill out a visitors application. Visiting is on Saturdays and Sundays from 9am-3pm. Registration for visiting is from 8:15am-2pm. You must arrive before 2pm or you will not be allowed to visit.